Eleazer Houghton 3d married Lois Sampson Gibson in Feb 3, 1803 at Grafton, Windham Co., VT, USA. Father* Eleazer Houghton Jr. b. 26 Aug 1737, d. 28 Dec 1826? Ruth Houghton married John Holman in Sep 1, 1801. Lois Houghton married William Palmer. Benjamin Burgess married Sarah Houghton, daughter of Eleazer Houghton Jr. and Susanna Holman, in Jan 11, 1796 at Grafton, VT, USA. Lois Sampson Gibson married Eleazer Houghton 3d, son of Eleazer Houghton Jr. and Susanna Holman, in Feb 3, 1803 at Grafton, Windham Co., VT, USA. John Holman married Ruth Houghton, daughter of Eleazer Houghton Jr. and Susanna Holman, in Sep 1, 1801. Birth 1782 circa 1760 dd calc. William Palmer married Lois Houghton, daughter of Eleazer Houghton Jr. and Susanna Holman. Notable Estate valued at $62,000,000. Royal Houghton married Persis French in Jun 12, 1823 at Andover, VT, USA, JWH: Jun. 1825. Royal Houghton married Calista Stearnes in May 14, 1856 at Chester, Windsor Co., VT, USA. Elizabeth Whitcomb married Manasseh Houghton, son of Eleazer Houghton Jr. and Susanna Holman, in Apr 14, 1796 at Grafton, Windham Co., VT, USA. Capt. Xenophon Houghton married Esther Eastman, daughter of James Eastman and Esther Stearns, in circa 1824. Calvin Eleazer Houghton married Abby D. Smith in Sep 10, 1823 at Grafton Twp, Windham Co., VT, USA. Esther Eastman married Capt. Xenophon Houghton, son of Manasseh Houghton and Elizabeth Whitcomb, in circa 1824. 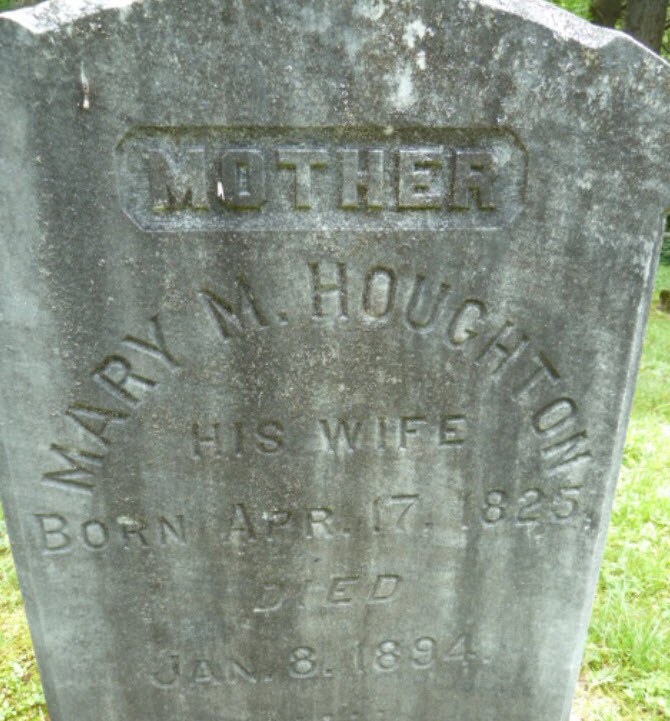 Mary Melinda Houghton married Alden G. Gibson in Oct 22, 1841 at Ludlow, VT, USA, Houghton Report: 22 Oct. 1844. Alden G. Gibson married Mary Melinda Houghton, daughter of Capt. Xenophon Houghton and Esther Eastman, in Oct 22, 1841 at Ludlow, VT, USA, Houghton Report: 22 Oct. 1844. Thomas Park Houghton married Sarah Barton in Dec 3, 1829 at MA, USA. Isaac Houghton married Sarah Ann Hastings in Nov 28, 1839. Calvin Curtiss Houghton married Harriet Strong. Calvin Curtiss Houghton married Lucy E. Johnson in Nov 13, 1845 at Chester, Windsor Co., VT, USA, MLM: Nov 13; JWH: Nov 11, 1846. Amanda Eliza Houghton married Ivers H. Wilder, son of Josiah Wilder and Susan Flint, in Apr 5, 1843 at Grafton, Windham Co., VT, USA, MLM: Feb 2, 1851 to James Wilder. Amanda Eliza Houghton married Ivers H. Wilder, son of Josiah Wilder and Susan Flint, in Apr 6, 1843 at Grafton, Windham Co., VT, USA. Sir Henry de Hoghton married Jane Radcliffe. Agnes de Hoghton married Sir Thomas Banastre. Sibyll de Hoghton married William Banastre. Sir Thomas Banastre married Agnes de Hoghton, daughter of Sir Adam de Hoghton and Ellen Venables. William Banastre married Sibyll de Hoghton, daughter of Sir Adam de Hoghton and Ellen Venables. Catherine de Hoghton married Hugh Venables.